Targetted water exercise can ease the pain of osteoarthritis and dramatically improve the lives of sufferers, according to a new study funded by non-profit organisation, National Swimming Pool Foundation. 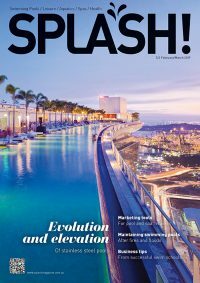 High intensity intervals, or HIT training, in water is good for you according to a research study published in the Journal of Strength and Conditioning Research, opening the door for millions of osteoarthritis (OA) patients who can use high intensity aquatic exercise for regular physical activity to better manage their arthritis. The landmark study, led by Eadric Bressel, PhD, professor and clinical research scientist at Utah State University, means that millions of people with arthritis can enjoy an improved quality of life with less stress, and less worry associated with pain and the risk of falling. Greater confidence and reduced fear will help them attain better physical condition, resulting in more comfortably participating in normal, everyday activities with co-workers, friends and family. “Having osteoarthritis patients walking against a systematically high and low resistance in water resulted in significant reduction in pain, improved mobility, balance and function,” says Bressel. “This same kind of high intensity interval training on land would be unfathomable because of the load- elicited pain,” he says. No other land-based training has been able to successfully implement high-intensity aerobic workouts for patients with osteoarthritis, likely because the aquatic environment created a reduced fear of falling, lowered joint loads, and provided three-dimensional support to help maintain balance. This study provides an evidence-based protocol that is effective at managing symptoms of OA. 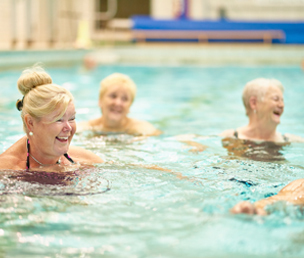 It is commonly accepted that aquatic exercise is helpful to those living with arthritis. This new study, incorporating high intensity, interval aquatic training, demonstrates that even better outcomes can be attained for sufferers. In the US alone, 27 million people suffer from OA. Additionally, more than a quarter of a million Americans are turning 65 each month; and 50 percent will develop some form of OA, according to the Centres for Disease Control. “Everyone can find a pool,” says Tom Lachocki, PhD, CEO of the NSPF. “Millions of people with arthritis can maintain better health just by walking and running in water. As they get stronger, they may feel more confident to exercise on land, too,” he says. An aquatic treadmill was used to test the hypothesis of the benefit of high intensity aquatic training for OA patients, which allowed researchers to maintain a high level of control and produce the same energy demands as equivalent to land-based exercise. The design of the study was a single-group double pre-test/post-test design whereby participants completed a four-week non-exercise control period followed by a six-week aquatic exercise intervention period. All participants had osteoarthritis and underwent three training sessions on the aquatic treadmill in a pool per week. Joint pain, balance, function, and mobility were tested before and after exercise and non-exercise conditions. In comparison with pre-tests, participants displayed reduced joint pain and improved balance, function and mobility. The same benefits were not observed after the non-exercise control period. All participants completed the six-week program with 100 percent exercise adherence. No-one reported adverse effects beyond typical mild-to-moderate muscle fatigue and soreness associated with high-intensity interval training. Motor functions and static balance also improved during the course of the study, with participants able to stand from a seated position more easily, lunge more quickly on one leg, and walk on land with greater speed. In fact, after the completion of the six weeks, participants’ gait speed was nearly identical to people without osteoarthritis.